CISV is a global, volunteer-led organization committed to working for a more just and peaceful world. We do this through building friendship and a commitment to local and global community service in our participants. Every year, our dedicated and passionate volunteers of all ages give their expertise, skills, life experience, energy, and time to run our Chapters, programmes, and Junior Branches. Our volunteers are also involved at every level of CISV International, offering leadership and support to our network of volunteers worldwide. Whether you’re 16 or 60, you can offer an hour or two every month or give a more regular commitment. There are many exciting and flexible ways for you to get involved with CISV. Our activities and programmes simply could not happen without our thousands of committed volunteers around the world. Come and join us! Being a JC is a great first time ’employment’ opportunity, where you get to take responsibility and develop your leadership, teamworking, and other personal skills. As a CISV JC, you will interact with children and young teens, help with activities and serve as leaders in maintaining the CISV camp spirit and motivation. As the right-hand-person of an adult staff, you will often assist them in running activities, lead kitchen duties, and take part in daily flag ceremonies and other routines. Most importantly, you will serve as a role model for our young participants. Take a delegation of children to a camp in Brazil or help staff a camp, and you’ll not only help enrich their lives, but your own as well! 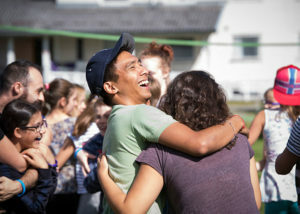 By the end of the camp you will have met many exciting CISV volunteers and children from around the world, and made friendships for life. You will be part of a team of committed, like-minded volunteers working to create an unforgettable experience for the children or young people in your care. You will have the support and leadership of our highly experienced staff. You will help children and young people develop the skills, knowledge, and attitudes they need to take a positive, active role in their local and global community. You will guide them as they build friendships, have fun, and learn from you and each other. Full training and support, a fun, supportive, inter-cultural environment, and the opportunity to enhance your CV and develop your personal skills. CISV Chapters are the hub of CISV and are run entirely by dedicated volunteers. Our Chapters organize and run our local and international programmes, run local activities, and recruit new members. Our Chapters are always pleased to welcome new volunteers to help with their regular work – fundraising, marketing, keeping the accounts, training, recruitment. Whatever skills and interest you have and however much time you are able to offer, your local Chapter will be interested in hearing from you! To get in touch with your nearest CISV Chapter, find CISV near you and get their contact details from the CISV National Association in your country. If you are already a CISVer, check out the exciting opportunities here.